I've dragged my feet about starting black soldier flies because the bins are relatively complicated, but after a bit of internet research, building our own is starting to feel feasible. It sounds like a successful black soldier fly bin will have good drainage at the bottom, air holes at the top to let in adults wanting to lay their eggs, and a ramp for the larvae to crawl up and out into the collection bucket. Raising black soldier flies is a relatively new endeavor, and there only seems to be one company producing pre-made bins. 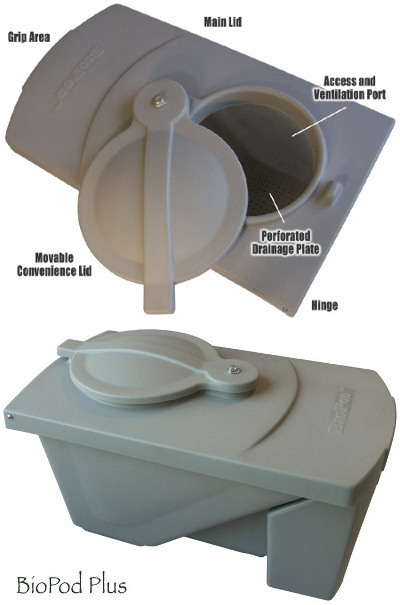 The original bin was called a Biopod, but now there are two different types of commercial bins available --- the Biopod Plus (which replaced the original Biopod) and the larger Protapod. If you were going to buy one of these bins new, you'd be shelling out $180 for the Biopod Plus, which composts 5 pounds of food waste per day, or $350 for the Protapod, which composts 20 pounds of food waste per day. Both bins are way too expensive for us, but they do serve as templates for the do-it-yourselfer. The ramp seems to be the complicated part of the system, since it needs to start at the bottom of the bin and lead up to the top at no more than a 40 degree angle. Most homemade bins I've seen have mimicked the original Biopod (and Protapod), trying to make a ramp lining the inside of a circular bin, but various websites report that it's tough to attach the ramp to the inside of the bin since it's wet in there and the larvae work hard to tear everything apart. Instead, the rectangular bin of the Protapod Plus with the simpler ramp seems like a system that could be replicated on the home scale with much more ease. 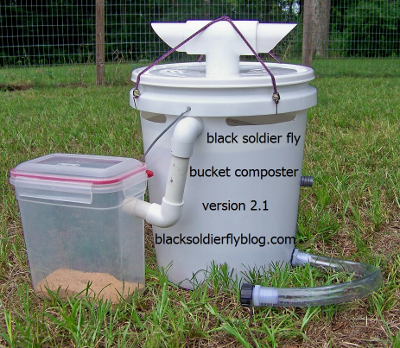 Black Soldier Fly Blog's DIY five gallon bucket bin has been tried by several folks and is reported to do quite well, although you have to manually raise and lower the ramp. The site is a great place to start your research into black soldier flies, but the bin is too small for most people, handling only about a pound of food scraps per day. My favorite DIY bin so far has been the one pictured below, which uses the same idea as the Biopod Plus to make a simple, mid-scale bin out of a tupperware container and some PVC pipe. The PVC method makes it seem like you could scale this version up indefinitely. 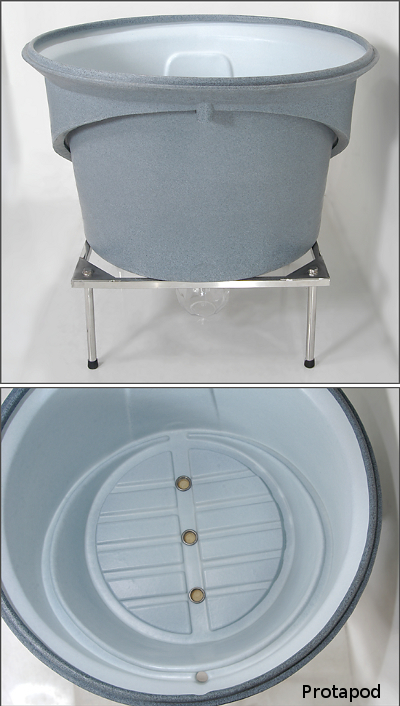 You can see a similar bin with more step by step instructions here. Some experts worry that the larvae won't be able to find the ramps in this sytem, but others report that they get very good crawl-off. When designing your bin, keep in mind that surface area determines how much food waste your bin will compost per day. Every square foot of surface area will allow you to put in about 3 pounds of food waste, so for the 18 pounds of food waste currently going begging from our food scrap program every day, we would need 6 square feet of bin. It seems remarkable that such a small bin could handle so much waste, but black soldier flies are insatiable. That said, black soldier flies aren't out flying in cold weather and their larvae can't work when temperatures are too cool, so this might not be the short-term solution for our extra food scraps after all. Stay tuned for more on the black soldier fly life cycle and how to winterize bins in later posts. Learn to create a niche business that pays all of your bills in just a few hours per week. Thanks for the great info, will check back, please post updates. LLB --- Unfortunately, our school food scraps program bombed before the weather warmed up enough to try black soldier flies, so we don't have enough high nitrogen scraps to put any plans into action. However, I recently noticed that black soldier flies have moved into a sodden section of horse manure in our worm bin, which suggests there may still be a possibility to put them to work on our farm. I wish we could visit you in Puerto Rico! It's tough to drag me off the farm even to visit my mother an hour away, though. Hey there. I used an existing compost bin to make my first version of BSFL bin. it used a poly tube wound around the inside as the ramp. It was too difficult for the BSFL to find their way out. For version two the bins have been tilted. Similar thing could be done to any kind of vessel. I considered making a mould to produce a few in concrete. Also considered ferrocement to make a larger bin. But I needed a bin pronto, and these bins were wasted otherwise. 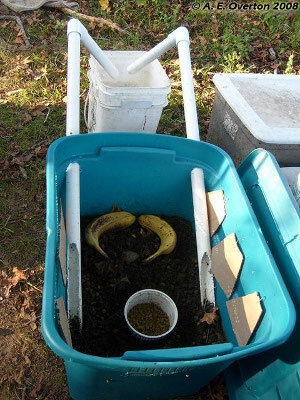 It will also be good to witness first hand how effective simple ramp BSFL compost bins are. Please have a look and offer any advice or ask any questions at my page.